CNG: eAuction 438. SPAIN. Æ (25mm, 18.31 g). Countermark applied early 1st century AD. 438, Lot: 325. Estimate $100. SPAIN. Æ (25mm, 18.31 g). Countermark applied early 1st century AD. 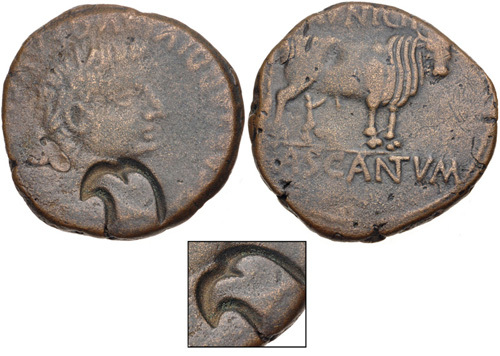 Eagle head shaped countermark on a bronze as of Tiberius from Cascantum. ACIP c/m 9; Pangerl 6. Host Good Fine, c/m VF, brown patina.